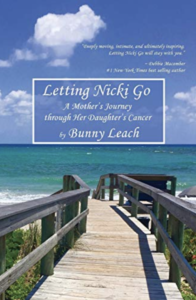 Nicki Leach was a happy teenager pursuing her dream of singing dancing and acting at the Douglas Anderson School of The Arts when, in the tenth grade she started to get sick. She spent months seeing various doctors and specialists, trying to determine the reason for her illness. Four days after her seventeenth birthday a CAT scan revealed a malignant stage four brain tumor, a biopsy identified the tumor as a glioblastoma multiforme. She courageously battled her disease, fighting through two brain surgeries, two years of chemotherapy, radiation, steroids, and many more pills and procedures all aimed at saving her life. Even though treatment was unsuccessful for Nicki, she never stopped smiling. After three years of fighting for her life she died at nineteen, but her spirit remains with us. When Nicki lost her ability to speak or write and became blind in one eye, she asked for a camera. She photographed everything she loved in the outdoors; plants, animals, insects and landscapes. Nicki’s camera became her constant companion. She took it everywhere with her, it was like a best friend. Her photographs have been displayed on shirts, and have been reproduced as greeting cards. Some of her photographs are displayed in public buildings. Through the special gift of a camera she captured the beauty on this earth. More of her photographs are on our Gallery page and under Nicki’s Facebook Photo Gallery. Thank you, for visiting.